Earlier this month, NewSouth released award-winning author Gerald Duff’s novel Coasters and his short story collection Fire Ants as ebooks, along with individual ebooks of each of Fire Ants‘ fifteen stories, and Duff’s new short essay Fugitive Days. We’re terrifically proud to offer these books by Duff, whose fiction Publishers Weekly praised for “wit and subtlety as simply satisfying as a tall cold one on a hot Gulf Coast afternoon.” But Fire Ants, Coasters, and Fugitive Days are just a few of Duff’s books earning praise from all corners. Home Truths: A Deep East Texas Memory is Gerald Duff’s memoir, published by TCU Press in 2011. Steven Whitton of the Anniston Star called Home Truths “just as wickedly comic and startling as [Fire Ants]” and Library Journal‘s Julie Kane said “Duff’s account of a life led against the grain in East Texas is keenly thematic, peppered with insightful accounts of the seemingly ordinary.” In Home Truths, Duff relates his childhood move to rural East Texas after his father Big Willie Duff lost his job, and how lying to survive — often in poverty — informed his later life as a writer and professor. Moon City Press published Duff’s novel Blue Sabine also in 2011. Named for the Sabine River on the border of Texas and Louisiana, Blue Sabine tells the generational story of the Holt family in their own words, especially the women, from 1867 to the present. “In this beautifully written, wondrously told novel,” writes the Southern Historical Quarterly‘s Steven Davis, “one family’s personal history merges with the larger currents of Texan and American history, creating a twisting, turning narrative that is as aesthetically satisfying as it is historically resonant.” Vanessa Blakeslee of the Kenyon Review wrote that Blue Sabine “will haunt you long after you’ve closed its pages.” Some of the chapters within Blue Sabine were inspired by Duff’s stories in Fire Ants. In 2012, the UL Press published Duff’s new novel Dirty Rice: A Season in the Evangeline League, which fictionalizes the 1935 Texas minor league team the Rayne Rice Birds and their pitcher Gemar Batiste. Batiste, a Native American, is constantly confronted with a sense of difference between himself and his teammates — not solely for the honor in which he imbues the game of baseball. Harry Levins of the St. Louis Post-Dispatch says “Duff gives readers who watch baseball on television new insight into the game as experienced by those who play it on the field”; on the Plaza de Armas website, Rod Davis (Corina’s Way, NewSouth Books) adds that “Duff’s new novel is about something else altogether: the purity of artistic passion.” ForeWord Reviews recently named Dirty Rice a finalist for their 2012 Best of the Year Award in the Adult Fiction category. 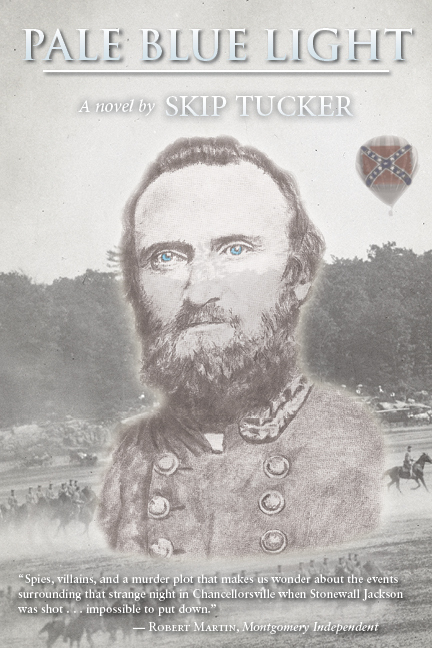 Finally, Duff’s Decoration Day and Other Short Stories, from the Stephen F. Austin State University Press, is a new collection with stories also related to Blue Sabine and Fire Ants, set in locations ranging from the piney woods of Deep East Texas, to the mean streets of Memphis, to the suburbs of Washington, DC. You can connect with Gerald Duff on his website, www.geraldduff.com, and learn more about Fire Ants, Coasters, and Fugitive Days from NewSouth Books. Publishers Weekly has praised Gerald Duff’s fiction for “wit and subtlety as simply satisfying as a tall cold one on a hot Gulf Coast afternoon.” NewSouth has a great selection of Duff’s books in print — and now as ebooks, too! Enjoy Duff’s novel Coasters, his collection of short stories, Fire Ants, and his new ebook “short,” Fugitive Days, all as ebooks, available for all major e-readers and devices. In addition, each of Duff’s stories from Fire Ants are available as individual ebooks for only $0.99. This includes the title story, “Fire Ants,” which won the Cohen Prize from Ploughshares Magazine, was cited in Best American Short Stories, and republished in The Editors’ Choice: New American Stories. This is a great way to check out Duff’s fiction — we know you’ll be hooked. 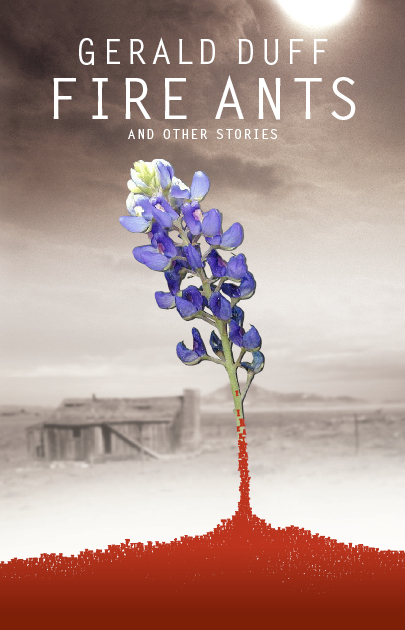 Duff’s first short story collection, Fire Ants and Other Stories, ranges in settings from the marshes and pine barrens of East Texas to the row houses of Baltimore, and in time from the Civil War to the present day. Each story conjures portraits of people captive to private delusions and bound to visions of what might be or might have been, struggling for escape and redemption. Highly comic and deeply serious, the stories collected in Fire Ants are perfect gems for reading individually or all together. Coasters follows Waylon McPhee, middle-aged and divorced, who moves back in with his widowed father. But even Waylon’s father is dating again, and the pressures on Waylon are great enough that he might not be able to just coast through another year. Humorous and melancholy, Gerald Duff’s Coasters perfectly presents the ennui of contemporary life in the suburbs of the petroleum-chemical corridor that stretches along the Gulf Coast from Texas to Mississippi. Learn more about Gerald Duff on his official website or on his author page from NewSouth Books. 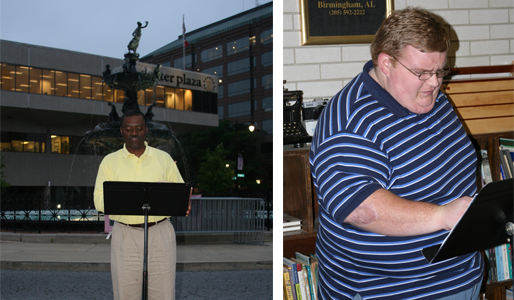 In celebration of National Poetry Month and in anticipation of the 2013 Alabama Book Festival, the second annual 24-hour poetry marathon will be held April 18-19 in downtown Montgomery. Any interested poets may participate by reading their own work or that of another poet, or both. Get on the list to read by calling 334-834-3556 or by sending an email to deric.sallas (at) newsouthbooks.com. At the 2012 event, author and poet Joseph Trimble reads at Court Square at sunrise; AUM student Matt Johnson reads in the NewSouth Bookstore. The event is co-sponsored by NewSouth Books, the Village Gallery, and Smoothies ‘n Things, at 105–109 South Court Street, at the corner of Court and Washington, just one block south of Court Square Fountain, and by Cool Beans at the Cafe d’Art, a block west of the fountain at 115 Montgomery Street. 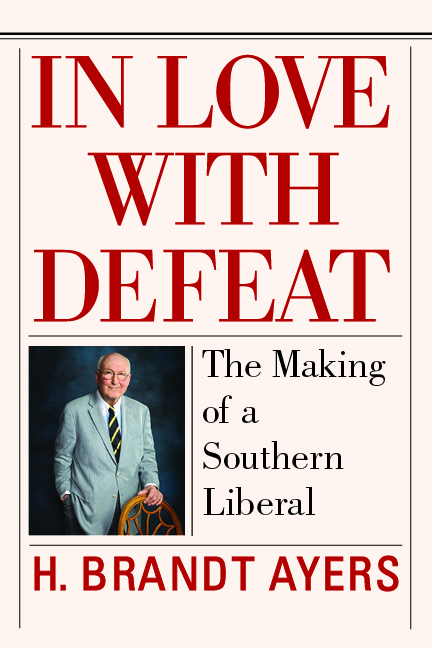 The event will begin Thursday, April 18th, at 6 p.m. at the NewSouth Bookstore. At 7:30 p.m. it will move next door to the Village Gallery. Around daybreak on Friday morning the reader for that time slot will move to Court Square Fountain for reading as the sun rises over the Alabama Capitol. At 7 a.m. the event will move to Cool Beans for a caffeine jolt, then to Smoothies n’ Things from 9–10:30 A.M., then back to the NewSouth Bookstore, and the last reader will end at 6 p.m.
On Friday evening, April 19th, the Alabama Book Festival will have its opening reception for the writers who will be on the program Saturday, April 20th. A full poetry track will be featured at the Festival, 10 a.m. to 4 p.m. (gates open at 9 a.m.), at Old Alabama Town (Hull and Jefferson streets, six blocks northeast of the fountain). Download the official Rhyme Around the Clock informational flyer. “If variety really is the spice of life, Dot Moore should know since she’s been a teacher, political leader, civil rights activist, popular author and mentor to many,” begins a new Montgomery Advertiser profile of Dot Moore, author of Oracle of the Ages: Reflections on the Curious Life of Fortune Teller Mayhayley Lancaster and No Remorse: The Rise and Fall of John Wallace. Reporter Al Benn’s column focuses on the Moore’s history of activism, including her work as a member of the Alabama Democratic Party’s Executive Committee, as president of the League of Women Voters, and currently as founder of the Montgomery Area Hearing Loss Support Group. 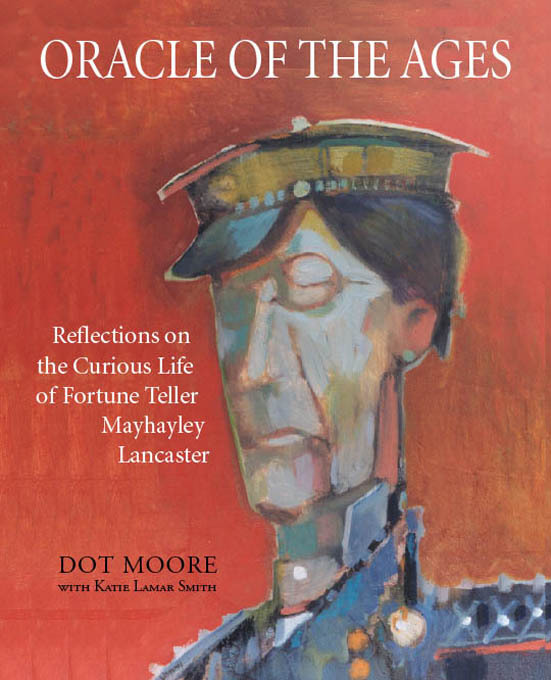 Moore’s Oracle of the Ages is the award-winning true story of Georgia’s Mayhayley Lancaster — lawyer, schoolteacher, political activist, fortune teller, numbers runner, and self-proclaimed “oracle of the ages.” Oracle offers strange and often hilarious stories of the poor Georgia South in the post-Depression era, and how the eccentric Mayhayley’s charisma and mysterious powers cast a spell on all the people who knew — and inevitably misunderstood — her. Oracle of the Ages was the 2002 winner of the Lilla M. Hawes Award for the best book in Georgia history. No Remorse, Moore’s newest book, digs into a 1948 murder committed in Georgia’s Coweta County, controversial not only for its middle-of-the-night mystery, but also for the role played by prominent businessman John Wallace. Moore explores not only that fateful night, but also the events that brought John Wallace to that point — the death of his father when Wallace was only eleven years old, and his early exposure to the making and selling of moonshine whiskey. Moore includes actual prison letters to and from Wallace before his ultimate conviction and execution, as well as copious historical images, to give a full picture of the Georgia figure. Read “Al Benn’s Alabama: Civil rights activist keeps busy schedule” from the Montgomery Advertiser. Oracle of the Ages and No Remorse are available directly from NewSouth Books, Amazon, or from your favorite bookstore. 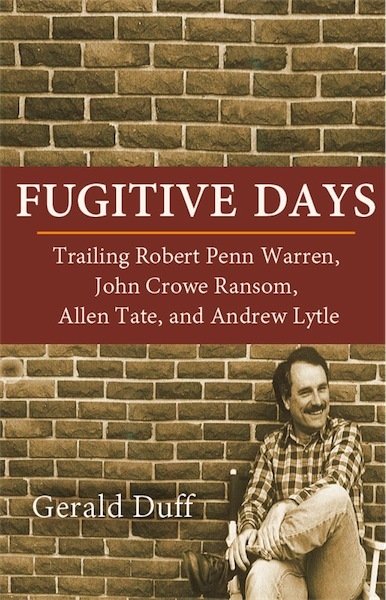 You are currently browsing the NewSouth Books weblog archives for April, 2013.